The Annandale Boys & Girls Club had the privilege to host the Virginia/North Carolina Golden Gloves Tournament in March. This event is the most prestigious in amateur boxing. Bobby Magruder, the Golden Gloves Regional Chairman, dedicated the tournament to ABGC’s founder and former Washington, D.C. Golden Gloves Champion, Everett Germain. We hosted three action-packed days of young men and women, boys and girls, who competed with the ultimate goal of being crowned Golden Glove Champions. When the smoke cleared and the dust settled, the Annandale Boys & Girls Club boxing team added another name to its long list of amateur champions. Mikhail Hussain walked away with the gold medal in his age and weight division. The Golden Gloves organization and ABGC boxing share the philosophy that there were no losers in this year’s event. Many of those competing are at-risk youth learning important life skills and striving to be all that they can be. In fact, ABGC boxing – in the spirit of Everett Germain – takes pride in the many young people who’ve used their boxing life-experiences to find their way toward college in addition to those who became professional boxers. ABGC has developed many good professional boxers including, Zain “Tiger” Shah, Tod “White Lightning” Wilson and Edgar “El Tigre” Torres. ABGC is proud of our boxers, including our latest Golden Glove winner. For more information on the Annandale Boxing program go to our website and stay tuned for more details on a major event being planned for the fall. The Annandale Boys & Girls Boxing Club is proud to support two boxers who competed in the 2016 Virginia/North Carolina Golden Gloves Tournament, Gilbert Vargas at 141 lbs and Jason Canamaso at 152 lbs. Vargas and Canamaso follow in the footsteps of several successful amateur ABGC champions including: Zane “Tiger” Shah who competed in the National Golden Gloves Tournament in 2002 and went on to have a successful professional career, Todd “White Lightning” Wilson who sports a perfect 16-0 record and has won the Universal Boxing Federation America’s title, a stepping stone to the worlds stage and Edgar “El Tigre” Torres also undefeated at 8-0-1. On the first night of competition in North Carolina, ABGC’s Gilbert Vargas was matched against Joshua Valles of the Alexandria Boxing Club. Gilbert rushed across the ring at the bell starting the first round, swarming his taller opponent. However, Valles used the ring and a long stiff jab to keep Gilbert off of him. Gilbert was in great shape and slipped Valles’ punches while scoring with punches thrown from all angles. The second round was more or less a repeat of the first with Gilbert out scoring his opponent. The third and final round started like the first two with Gilbert scoring at will as his opponent was starting to tire from an accumulation of punches from the much more experienced Gilbert Vargas. Midway through the round the Alexandria coaches called a halt to the bout feeling their fighter, though he was still game to keep fighting, was taking too much punishment. The victory went to Gilbert Vargas of Annandale Boys & Girls Club. Next up was ABGC’s Jason Canamaso versus Dorian Bastic unattached (meaning no club represents him). 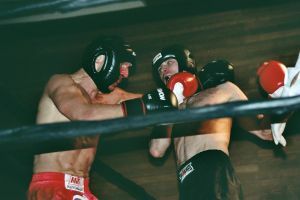 This was Jason’s first fight. Even so, it was a close fight and very hard to score as both fighters were in good shape and threw a lot of punches. All three rounds were action packed. It was a close match and appeared Jason had pulled out the victory. However, the judges scored it for his opponent, Dorian Bastic. It’s a decision we can live with, since Jason fought so well. In his second round of competition, Gilbert Vargas was matched against Imani Clayton of Jassards Boxing. This was probably the toughest fight of the entire tournament for Gilbert. Imani Clayton was in great shape and showed he had skills to go along with his conditioning as both boxers gave everything they had for three hard rounds. We had no idea who would win by the final bell; however, the judges scored ABGC’s Gilbert Vargas as the victor sending him to the finals against Khari Clinkscales (unattached). Since you have read to this point, here’s challenge for you — it’s your turn to judge the Championship bout. We have the video of all three rounds available for you to watch and score. You decide who the 2016 141 lb Virginia/North Carolina Champion is. Scoring is done on a ten point must system. Ten points go to the winner of the round, nine to the loser. Take into consideration that blocked or missed punches do not score. The power of the hit is what scores, as well as the accuracy of the punch. The Annandale Boys & Girls club offers boxing for fitness and self-defense as well as competition. We accept people of all ages and from all geographical locations. Rates are $20 per month for children, $30 per month for college students, $40 per month for adults. No one is turned away for an inability to pay; in lieu of money you will be asked to volunteer your services to aid the Annandale Boys & Girls Club. For more information contact us at: annandale_boxing@outlook.com and read more about program on our website.